What’s the effect of AI and Machine Learning on IT? Here’s another video quick take on AI and Machine Learning. 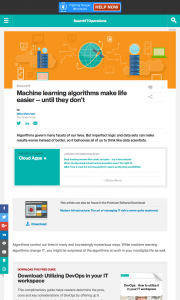 Watch this to hear about how Machine Learning is starting to seriously impact IT, both from a user workload perspective, and now as it’s being used in IT systems management. Algorithms control our lives in many and increasingly mysterious ways. While machine learning algorithms change IT, you might be surprised at the algorithms at work in your nondigital life as well. When I pull a little numbered ticket at the local deli counter, I know with some certainty that I’ll eventually get served. That’s a queuing algorithm in action — it preserves the expected first-in, first-out ordering of the line. Although wait times vary, it delivers a predictable average latency to all shoppers. Now compare that to when I buy a ticket for the lottery. I’m taking a big chance on a random-draw algorithm, which is quite unlikely to ever go my way. Winning is not only uncertain, but improbable. Still, for many folks, the purchase of a lottery ticket delivers a temporary emotional salve, so there is some economic utility — as you might have heard in Economics 101. People can respond well to algorithms that have guaranteed certainty and those with arbitrary randomness in the appropriate situations. But imagine flipping those scenarios. What if your deli only randomly selected people to serve? With enough competing shoppers, you might never get your sliced bologna. What if the lottery just ended up paying everyone back their ticket price minus some administrative tax? Even though this would improve almost everyone’s actual lottery return on investment, that kind of game would be no fun at all. Without getting deep into psychology or behavioral economics, there are clearly appropriate and inappropriate uses of randomization. When we know we are taking a long-shot chance at a big upside, we might grumble if we lose. But our reactions are different when the department of motor vehicles closes after we’ve already spent four hours waiting. 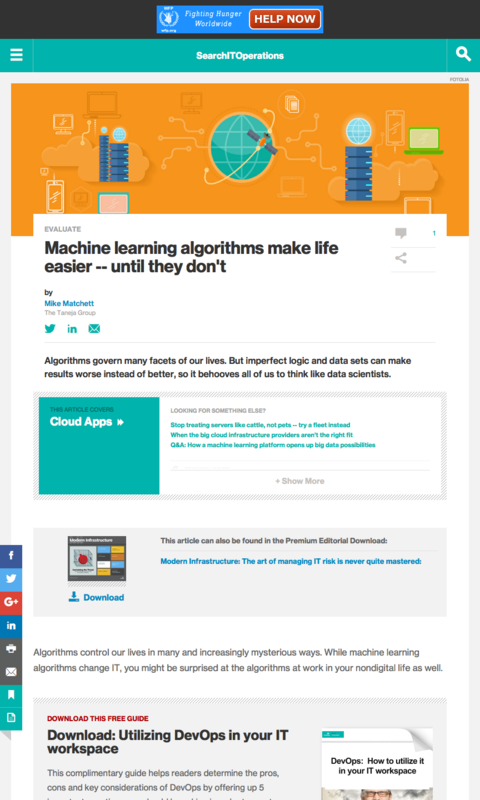 Machine learning algorithms overview — machines learn what? So let’s consider the supposedly smarter algorithms designed at some organizational level to be fair. Perhaps they’re based on some hard, rational logic leading to an unbiased and random draw, or more likely on some fancy but operationally opaque big data-based machine learning algorithm. With machine learning, we hope things will be better, but they can also get much worse. In too many cases, poorly trained or designed machine learning algorithms end up making prejudicial decisions that can unfairly affect individuals. I’m not exaggerating when I predict that machine learning will touch every facet of human existence. This is a growing — and significant — problem for all of us. Machine learning is influencing a lot of the important decisions made about us and is steering more and more of our economy. It has crept in behind the scenes as so-called secret sauce or as proprietary algorithms applied to key operations. Infrastructure is getting smarter by the day. It’s reached the point where I’m afraid artificially intelligent IT will soon turn the tables and start telling me how to manage my own personal “lifecycle.” Well, I would be afraid if I believed all those AI vendors suddenly claiming they offer AI-powered infrastructure. 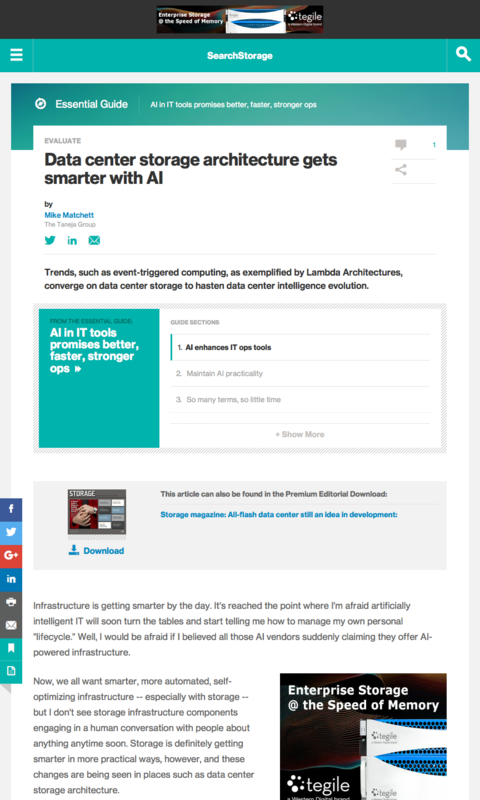 Now, we all want smarter, more automated, self-optimizing infrastructure — especially with storage — but I don’t see storage infrastructure components engaging in a human conversation with people about anything anytime soon. 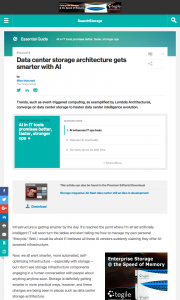 Storage is definitely getting smarter in more practical ways, however, and these changes are being seen in places such as data center storage architecture. I’m excited by the hot storage trend toward embedding machine learning algorithms aimed at key optimization, categorization, search and pattern detection tasks. Corporate data assets are growing, and so is the potential value that comes from gathering and analyzing big data. It’s difficult to manually find those nuggets of data gold, though. And with the coming onslaught of the internet of things (IoT), data prospecting challenges will add mining huge amounts of fast streaming, real-time machine-generated and operational transactional data to the mix. 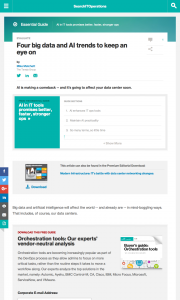 An IT industry analyst article published by SearchSQLServer. 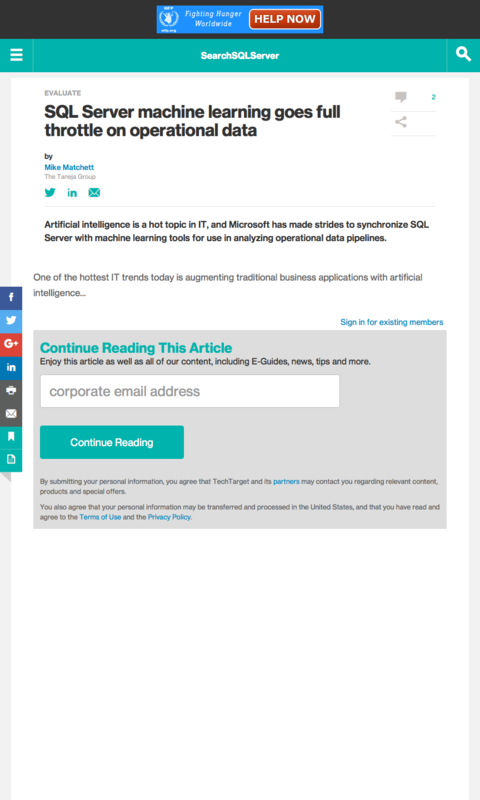 Artificial intelligence is a hot topic in IT, and Microsoft has made strides to synchronize SQL Server with machine learning tools for use in analyzing operational data pipelines. One of the hottest IT trends today is augmenting traditional business applications with artificial intelligence or machine learning capabilities. I predict the next generation of data center application platforms will natively support the real-time convergence of online transaction processing with analytics. Why not bring the point of the sword on operational insight to the frontline where business actually happens? But modifying production application code that is optimized for handling transactions to embed machine learning algorithms is a tough slog. 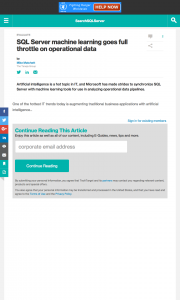 As most IT folks are reluctant — OK, absolutely refuse — to take apart successfully deployed operational applications to fundamentally rebuild them from the inside out, software vendors have rolled out some new ways to insert machine intelligence into business workflows. Microsoft is among them, pushing SQL Server machine learning tools tied to its database software. Basically, adding intelligence to an application means folding in a machine learning model to recognize patterns in data, automatically label or categorize new information, recommend priorities for action, score business opportunities or make behavioral predictions about customers. Sometimes this intelligence is overtly presented to the end user, but it can also transparently supplement existing application functionality. In conventional data science and analytics activities, machine learning models typically are built, trained and run in separate analytics systems. But models applied to transactional workflows require a method that enables them to be used operationally at the right time and place, and may need another operational method to support ongoing training (e.g., to learn about new data). In the broader IT world, many organizations are excited by serverless computing and lambda function cloud services in which small bits of code are executed in response to data flows and event triggers. But this isn’t really a new idea in the database world, where stored procedures have been around for decades. They effectively bring compute processes closer to data, the core idea behind much of today’s big data tools. 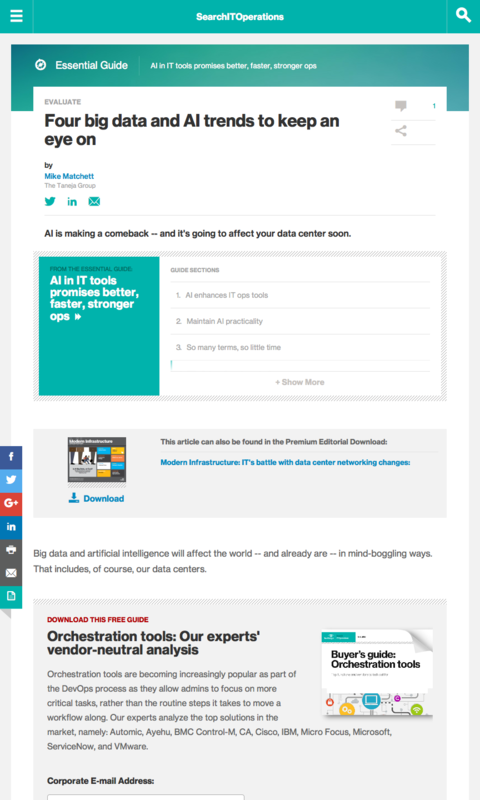 AI is making a comeback — and it’s going to affect your data center soon. Big data and artificial intelligence will affect the world — and already are — in mind-boggling ways. That includes, of course, our data centers. The term artificial intelligence (AI) is making a comeback. I interpret AI as a larger, encompassing umbrella that includes machine learning — which in turn includes deep learning methods — but also implies thought. Meanwhile, machine learning is somehow safe to talk about. It’s just some applied math — e.g., built-over probabilities, linear algebra, differential equations — under the hood. But use the term AI and, suddenly, you get wildly different emotional reactions —for example, the Terminator is coming. However, today’s broader field of AI is working toward providing humanity with enhanced and automated vision, speech and reasoning. Where there is a Spark… Apache Spark is replacing basic Hadoop MapReduce for latency-sensitive big data jobs with its in-memory, real-time queries and fast machine learning at scale. And with familiar, analyst-friendly data constructs and languages, Spark brings it all within reach of us middling hacker types. As far as production bulletproofing, it’s not quite fully baked. But version two of Spark was just released in mid-2016, and it’s solidifying fast. Even so, this fast-moving ecosystem and potential “Next Big Things” such as Apache Flink are already turning heads. Even I can do it. A few years ago, all this big data and AI stuff required doctorate-level data scientists. In response, a few creative startups attempted to short-circuit those rare and expensive math geeks out of the standard corporate analytics loop and provide the spreadsheet-oriented business intelligence analyst some direct big data access.